GALION — Galion City Schools moved a step closer to constructing a bus garage on its campus when Galion City Council approved rezoning the property the district acquired several years ago as Educational Services District. Buses are expected to enter and exit the bus garage on the access road that starts at the Galion Middle School parking lot. The vehicles will only go south as needed to enter the bus lot. In addition to the added mileage expenses caused by empty buses, the district also must pay drivers’ wages for driving back and forth from the campus to the current bus garage, which equates to a minimum of 25 minutes of additional time spent daily. Current maintenance staff members spend several hours daily — as needed — going back and forth between the current maintenance facility and the campus. 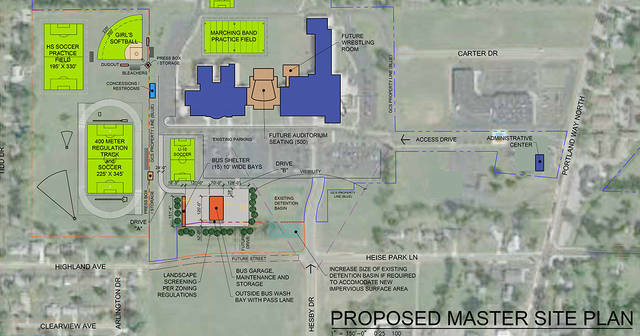 The Board of Education approved MKC Architects to lead the project. Grubbs anticipates building plans will include shielding the east and west sides of the bus garage by adding additional trees and shrubs, while not removing the tree line on the south side of the proposed property area. The district will soon launch an informational page on its website designed to give community members an opportunity to ask questions about the specific bus garage project, dispel rumors about the project in the community and provide updates on the project’s status with the community.